Find out why it is important to ventilate your kiln! Having an adequate kiln ventilation system for electric kilns promotes a safe work environment. There are three basic types of ventilation-updraft, downdraft and cross draft-and any of these systems would aid the potter in venting their own electric kilns. Why is it important to vent a kiln? Apart from the sometimes objectionable smell encountered in the first stages of firing, there can be several potentially harmful emissions released when clay and glaze materials are heated. There has been increased concern over limiting or eliminating any health or safety hazards in the workplace or home, and almost every day we hear of risk factors to our well-being. With such a high degree of information and awareness, it’s only common sense to investigate our workplaces and recreational activities. The goal should be to incorporate any safety measures to ensure low risk to ourselves and others. When working in ceramics, we all come into direct and indirect contact with clay and glaze materials. Specifically, clay goes through several transformations when heated to progressively higher temperatures. Mechanical water is driven off at 212°F, followed by the release of chemically combined water. While these “hidden” effects are not noticed by the potter, other changes in the clay are more apparent, namely, the oxidation or organic matter present in some degree in all clays. Organic matter in clay can take the form of pieces of wood, leaves, coal, binders, paper or any other combustible material. When exposed to enough heat, the organic material burns and releases particles and gases, carbon monoxide being one of the most objectionable. A textbook for today’s ceramics studio! Loaded with new color images that highlight some of the most beautiful results possible with electric firing, the new edition of the seminal Electric Kiln Ceramics features step-by-step instruction on forming and finishing pieces for electric firing, schedules for firing both manual and computerized kilns, and even glazing techniques and recipes to try out in your electric kiln. In addition, the “rotten eggs” smell often encountered in bisque firing is the result, in part, of small amounts of sulfur found in the clay being oxidized. The actual amount of sulfur can vary from one type of clay to another. For example, ball clays and stoneware clays might have a significant amount of sulfur while kaolins might have very little or none. The amount of sulfur or any organic material found in clays can also increase or decrease within a specific type of clay from year to year or even from bag to bag. Burning organic and sulfur compounds from the clay is good because, if left, it can cause black coring and bloating later. The idea, however, is to capture the unwanted carbonaceous materials and move them away from the studio area, and electric kiln venting systems are very effective devices for doing this. There are three basic types of ventilation systems available for the small recreational or school studio-updraft, downdraft and crossdraft. Updraft ventilation operates by exhausting smoke and fumes as they rise from the kiln, while downdraft systems draw smoke and fumes out from the bottom or base of the kiln. Each of these systems utilizes a fan connected to duct work, which is vented to the outside. The crossdraft system relies on adequate ventilation within the room or studio where the kiln is operating, typically an open window with an exhaust fan. An updraft venting system removes fumes, smoke and vapors as they rise. This system consists of a hood with a fan, which may be purchased or fabricated, usually by a local heating and cooling contractor. The lid should be propped open during the carbon burnout period and the top peephole should be left open during the firing. An updraft venting system is mounted over the top of a kiln. Updraft systems may be custom built by a heating and cooling contractor, or they may be purchased ready made. An exhaust hood passively removes combustible emissions and fumes generated from the firing kiln, and the kiln exhaust exits the studio via a flexible aluminum hose supplied with the system. A downdraft system draws unwanted fumes, smoke and vapors from the bottom or base of the kiln. A system, developed by the Orton Foundation and produced by a variety of manufacturers under license, operates on the principle of removing just the fumes and smoke and none or little of the heat. A downdraft ventilation system vents smoke and fumes from the bottom of a kiln. To achieve this in an electric kiln, holes must be drilled in the top of the kiln, typically in the lid, and along the bottom or in the base of the kiln. A collector or plenum is added to the bottom or base of the kiln and an electric fan (located on the kiln or nearby) draws off fumes and vapors. The system actively draws fresh air from the holes drilled in the top of the soft-brick kiln, and exhausts them to the outside. A crossdraft system relies on fans located near the kiln to move air from the surrounding area out through a nearby open window or door. This method, while not as sophisticated, is better than no ventilation at all. The lid should be propped open during the carbon burnout period and the top peephole should be left open during the firing. Before popular venting systems came onto the market, a common method of curtailing electric kiln fumes was to open the windows of the studio and create a crossdraft. Many potters still use this “low-tech” method, together with a house fan, to circulate air within the kiln room. Is this old method safe? It has been proven that the newer venting systems do remove greater volumes of unwanted kiln exhaust than just opening the studio windows. Winter months and the variable factors of air flow within any given kiln room dictate another approach to clean air. Consequently, the best course of action is to take advantage of the new highly efficient venting systems currently available to potters. Place the kiln in an area that can be adequately vented and away from regular studio activities. The kiln should stand on a noncombustible surface and away from any walls. Always follow manufacturers’ recommendations on kiln placement. If the kiln does not have a venting system, open the windows and use a fan to create a crossdraft in the kiln room. Before using a kiln ventilation system, carefully read and understand the manufacturer’s installation and operating instructions. In any kiln venting system, always exhaust outdoors. Periodically check and maintain the condition of any kiln venting system. With any kiln ventilation system, keep the electric power cord away from the kiln. Electric kilns are not designed for burn-out firings, so do not place large amounts of combustible material in the kiln. Electric kilns can accept wax on pots, organic material found in clays and organic binders used in glazes. 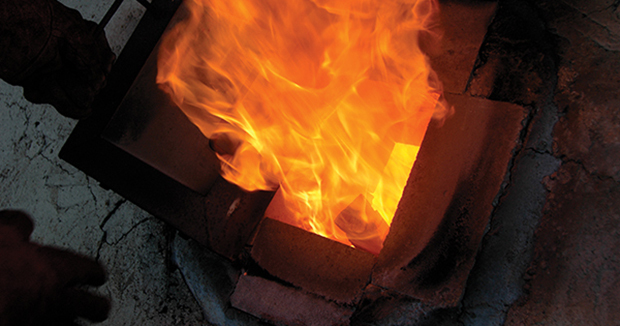 While heavy smoke or smell from an electric kiln during firing indicates insufficient venting, keep in mind one of the byproducts of burning organic materials found in clay and glaze material is carbon monoxide, which is colorless, odorless, and dangerous. Always create a kiln room environment where there is adequate air circulation and ventilation. bisque firing, bloating, chemically combined water, clay, cross draft, downdraft kiln, draft, oxidation, stoneware. I have a lampworking studio so it is very well ventilated. 1,600 CFM per minute fan exhausting outside. lwant to buy ceramic kiln what is the best brand? I never would have thought about the need to vent kilns correctly. It makes so much sense to make sure you’re doing is safe that I feel a little dumb for not thinking about it earlier, actually. It makes a lot of sense to vent outdoors, and only use your kiln for what it was designed for. Thank you so much for the advice!